At K 2013, PET preform technology specialist SIPA exhibited a 128 cavity mold incorporating X-Mould technology. X-Mould is a new approach to PET preform mold design of SIPA. It enables processors to fill thinner wall sections, so designers can create preforms that are longer or wider, and which create containers with more suitable stretch ratios. For example, it is now possible to design a 500mL bottle preform weighing as little as 7.2g that presents no production issues, either in injection or in stretch-blow with existing legacy equipment. 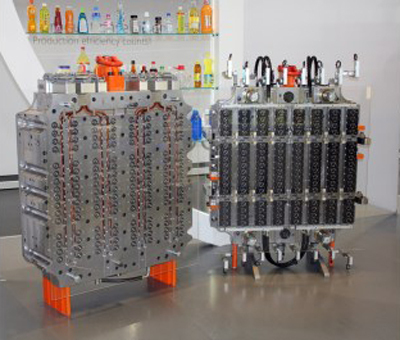 The preforms can be molded and blown cost-effectively while maintaining the high mechanical performance required in the finished bottle, says the company. The energy and materials saving ensures a lower carbon footprint in production. X-Mould technology is now possible to produce preforms with ratios of length to wall thickness (L/t) close to 60, while applying injection pressure similar to that normally used for preforms with 45L/t ratios. This means that the stretch ratio in the final 7.2g bottle is between 10.5 and 13.6, depending on its design, which is highly manageable for modern stretch-blow molding equipment. SIPA guarantees a mold life of up to eight million cycles for its cold halves. Hot runners, an integral part of PET preform molds, are also made engineered and built in-house.